Sunday Morning Skate from ECP to MBS & Back! 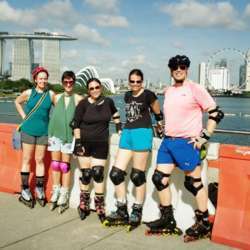 You must be a member of the Singapore East Coast Rollerblading Group to attend this activity. Would you like to join this group? We will meet at Protected content . Estimate to cover at least Protected content . Once arrived at Marina Bay Sands (MBS), we might stop for a coffee before turning back. For those who wish to stop at MBS, you may do so. We will then have brunch at ECP after our skate! For those who do not own skates, there is a skate rental shop near the meeting point. **Please call them to check if they carry your size prior to making your way there. Do allocate ample time for trying out the skate before the event meeting time. PS: In case of bad weather, the event will be canceled Protected content prior to commencement time. For more information, please contact the event organizer to reconfirm. Thank you.